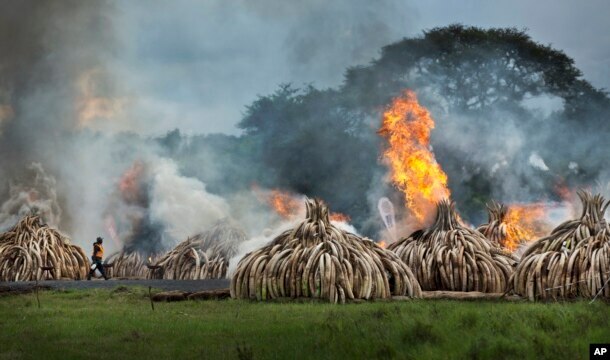 Nairobi, Sept 27, 2016: The air around Nairobi National Park was filled with enormous orange flames and dense smoke in April, an image as 105 tons of elephant ivory and 1.35 tons of rhino horn were destroyed. Kenya conducted the event to demonstrate that ivory has no value to anyone except elephants. President Uhuru Kenyatta pledged his country’s support for a complete ban on the ivory trade at the conference for the global conservation body known as CITES, which opens Saturday in Johannesburg, South Africa. CITES, the Convention on International Trade in Endangered Species, is expected to make a determination on whether countries in Africa should destroy seized ivory or be allowed to sell it to fund conservation efforts. The question has sparked heated debate on the continent, with some arguing that the future of elephants is at stake. FILE – A worker carries spray bottles of gel fuel to help the burning, as he walks past pyres of ivory that were set on fire in Nairobi National Park, Kenya, April 30, 2016. Tens of thousands of elephants have been killed in recent years for their ivory, as a result of strong demand from Asian markets. The recent “Great Elephant Census” showed a 30 percent decline in African savanna elephants between 2007 and 2014. About 30 African countries, including Kenya, want a comprehensive ban on all international trade in ivory. “Nobody should buy ivory in the world,” said Paul Udoto, corporate communications manager for the Kenya Wildlife Service. Namibia and Zimbabwe have officially requested through CITES the right to sell their ivory stockpiles. Along with South Africa, these countries say they want to put the proceeds toward conservation efforts. Zimbabwe’s finance minister, Patrick Chinamasa, suggested to parliament in July that there could be other uses for the funds from ivory sales. 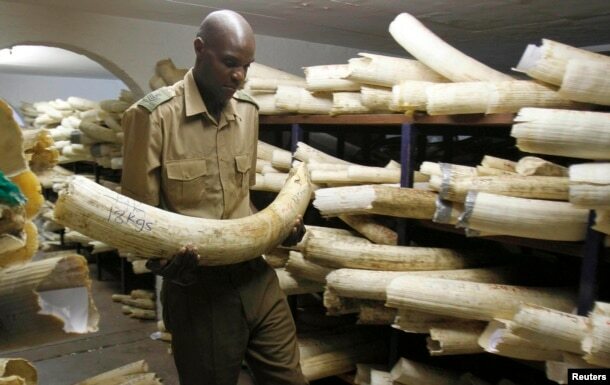 FILE – A Zimbabwe National Parks and Wildlife Management official checks ivory inside a storeroom in Harare, Aug. 22, 2012. South Africa says destroying ivory makes it scarcer, upping the black market price and driving more poaching. Kenya argues that previous “one-time” sales have demonstrated the opposite is true, and that opening up trade for some countries puts elephants across the continent at risk. Muruthi also emphasized the importance of a united African voice during the upcoming CITES talks. “I know there are challenges, but I do believe an agreement will be found and it will be found for the good of the continent. It will be for the good of the elephants, and for the many, many communities and national economies that depend on elephants,” he said.